We’ve done our best to add as many icons as we could think of to our Google Maps app, but we couldn’t even imagine the huge variety of cases it is used for right now, and so sometimes it’s necessary to add a custom icon for a marker. I’m going to give you a tutorial on how to do it, and I hope you’ll find it useful! 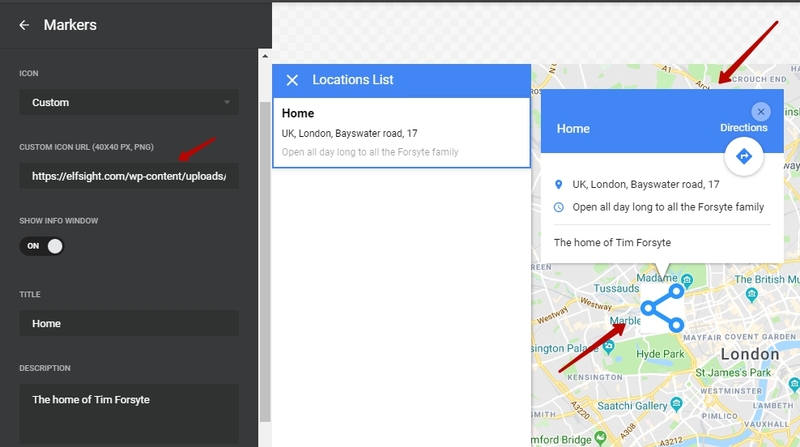 Before you can add your own custom icon to the Google Maps widget, you need to upload it to your server or to your website’s admin panel first. Important!!! Custom icon needs to be in PNG format, 40×40 pixels. After you’ve uploaded the icon, you can add it to the widget. As you can see, the image you’ve added will be displayed as the marker icon on your map, and clicking on it will call up the info window. I hope this has explained it! If you have any questions that our articles don’t answer, please, message me at apps@elfsight.com and I’ll be happy to consult!